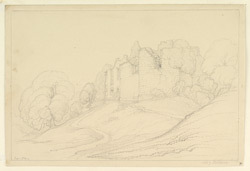 View of the ruins of Tutbury Castle in Staffordshire. It lies on a rocky hill 100ft above a plain and north west of the town of Tutbury. It was originally a motte and bailey castle and was owned by the de Ferrers family, Earls of Derby. After the castle was captured by Henry II in c.1175 it was sacked. Since 1265 its owners have been the Earls and Dukes of Lancaster. During the Civil War, Charles I and Prince Rupert stayed here but it was captured and partly dismantled by the Parliamentarians. The actual fabric of the castle, is mostly 15th century or later, although it does have a Norman chapel and 14th century gateway.